China Mobile Pakistan popularly known as Zong has been honored with the ‘Fastest Growing Cellular Network’ Award for the year 2013 by Rawalpindi Chamber of Commerce and Industry (RCCI) at the prestigious 26th Achievement Awards Ceremony held recently. The chief guest on the occasion was the honorable President of Pakistan, Mr. Mamnoon Hussain. Zong, part of the China Mobile - largest Telecom operator in the world, started its operations only a few years back in 2008, has taken a giant leap in the competitive market of telecom services by introducing customer centric services for different segments of mobile phone users. Having earned the image of #1 in customer services, Zong continues to expand its network at exponential rate and is now offering the 2nd widest coverage in the country. 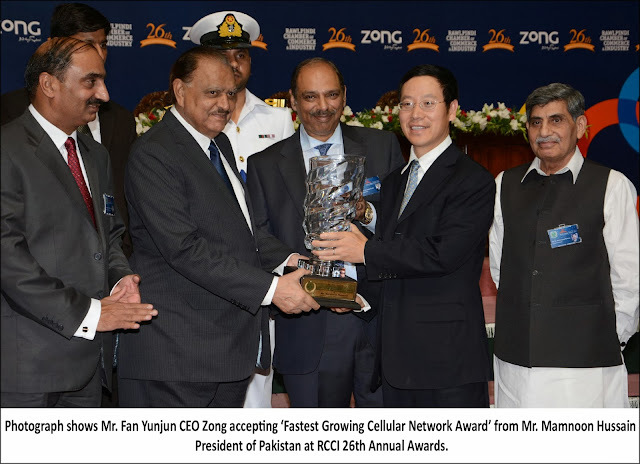 The ‘Fastest Growing Cellular Network’ Award is yet another milestone for Zong in addition to the ‘Most Progressive Telecom Company’ Award that it received last year by RCCI. Annual Achievement Awards Ceremony is a yearly feature of RCCI, designed to acknowledge the performance and achievements of members of the business community. The selection of Zong yet again is solely based on its exemplary business performance in the field of telecom. With the preference of 53% customers in 2012 in the entire industry, Zong remains the telecom operator of choice in Pakistan. With the passage of time, Zong has not only managed to attract a fair share of the market but has also invested billions of dollars in Pakistan. By growing its operations, CMPak is also creating employment opportunities for the talented people of Pakistan. The company has generated more than 3000 direct and over 40,000 indirect jobs in the country.